Photo courtesy of Valvoline Cummins. 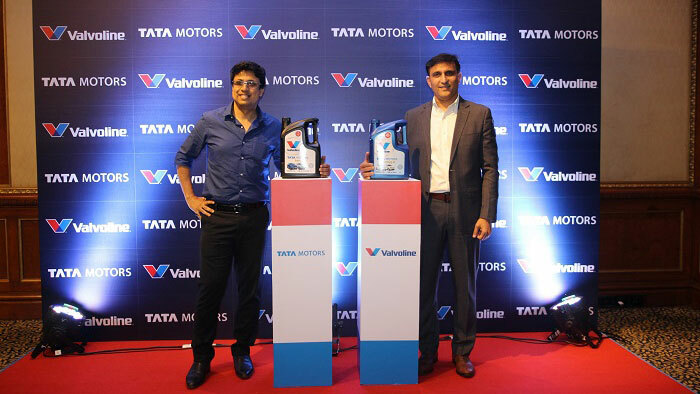 Valvoline Cummins Private Limited (VCPL) and Tata Motors announced the launch of their co-branded lubricants for the passenger car segment. These lubricants will be branded as Tata Motors Genuine Oil and will be available for all Tata Motors cars in the retail market. Tata Motors Limited, India’s largest OEM and part of the USD100 billion Tata group, is a leading global manufacturer of cars, utility vehicles, buses, trucks and defence vehicles. The launch of the co-branded lubricant was attended by Subhajit Roy, senior general manager & head customer care (Domestic and International Business), PVBU, Tata Motors, P. Shanmugasundaram, head, Service Marketing; Sandeep Kalia, Valvoline Cummins CEO, SK Mukherjee, chief technical officer, VCPL, Jitesh Mehta, director, Retail Sales & Marketing, and Rupesh Kushwaha – VP, OEM partnerships, VCPL. “We are honored to partner and work closely with an automotive giant like Tata Motors. Valvoline has had a long history of partnering with key automotive companies to bring innovative premium lubricants to market, and this milestone represents the success of our business model in India. This partnership will be a true testimony to Valvoline’s world-class products, and we are looking forward to providing superior quality and aftermarket product support to Tata Motors customers through our partnership,” said Valvoline Cummins’ Kalia. Valvoline Cummins Private Limited is one of the fastest-growing lubricant companies in India, and is a joint venture with Cummins India Ltd., leaders in diesel and natural gas engine manufacturing.